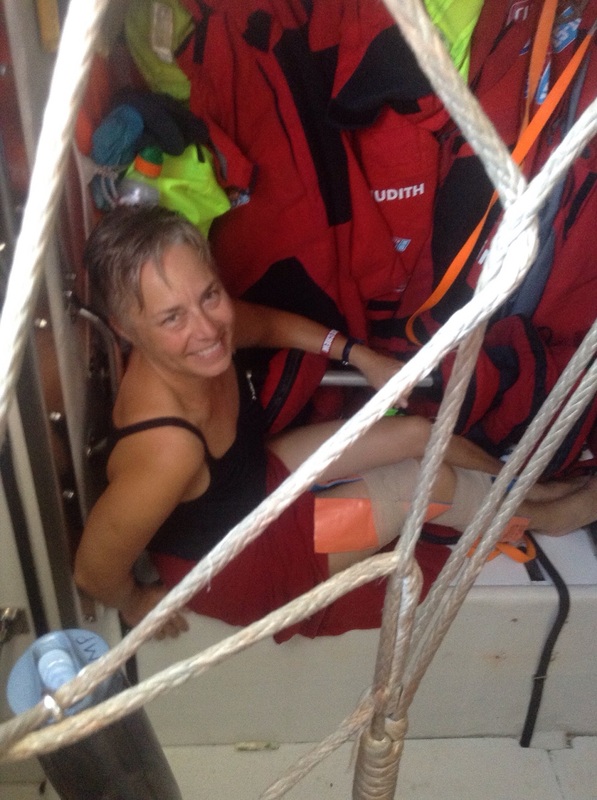 Lynn sitting, knee braced, in the "wet locker" amongst the "foulies" (foul weathe gear) on a hot day trying to catch a bit of breeze down below. About 10 days into the race, I lost my footing below deck when the boat suddenly lurched and I popped out my right knee. I popped it back in again right away. But the damage was done. Since then, it's been a slow process of rehabilitation. Strict bedrest for 48 hours. Icing, elevation, ibuprofen... I was in a splint for about 10 days. Out of the splint for stretching 2-3 times per day. Always in the splint for moving about. No splint at night. I joined my watch on deck gradually as able. There were mini milestones each day. Reducing pain meds, getting on deck, doing various useful tasks on deck, grinding the Yankee sheet in, graduating to a soft athletic knee support, getting back to helming, setting the cunningham sail control at the mast, walking about the deck to do a thorough deck check on a gentle day of sailing. Moving about the boat with a bum knee has been a challenge. Especially when on anything more than a slight tilt. Fortunately, much of the time we have not been close hauled, so not too much tilting. Strangely, I think I'm recovering well due in part to the fact that I am moving about on a boat. I must always very careful and mindful of body positioning. There is also movement all the time - the floor and walls are in constant motion, challenging the knee slightly to strengthen and be stable at all times. Even when lying down, the rocking of the boat jostles the knee in a kind of gentle massage. try to contribute and give back in whatever ways I can. We have opened up "Salon Ellwood". Services include neck massage, hair detangling and French braiding. I trade jobs I can do, like cleaning the heads or doing log entries, for jobs I can't, like emptying the bilge in the stern of the boat. Those of you who know me well might think of me as over-the-top independent and self reliant - to a fault. Here, I am chided for not asking for help. It's hard for me to ask for help, but I am learning from the receiving end the truth in the saying, "a friend in need is a friend indeed". The friendship and generous support I have received through this experience is so appreciated! Thank you fabulous ClipperTelemed+ team for reminding me of the importance and value of interdependence.